The average time for a single benefits applicant to complete FormFire is 12.5 minutes, with around four additional minutes for each dependent. Filling in medical benefits application paperwork is a job nobody likes to do. Now there’s FormFire, an option that is quicker than traditional health benefits applications. FormFire’s unique online interview not only lets people spend less time submitting details, but ‘smart’ technology creates a customized process just for them, only requiring information relevant to their personal situation. If filling one paper application is a chore, imagine filling in five, six, or even ten. That’s what it might take to properly apply to the whole benefits market for confirmed price rates. 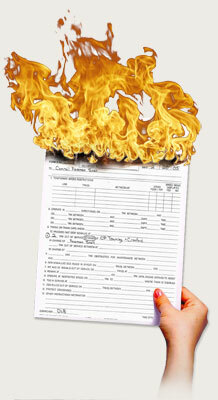 FormFire makes filling in multiple applications a thing of the past. Its unique approach means that with one online interview, all relevant applications can be produced for each and every individual. The FormFire service stores all the information entered by each applicant in a HIPAA-compliant personal and private account. This means that at a policy renewal or during a search for a new provider, all information is available again—only requiring individuals to review and update their account. Most people are done in less than five minutes. All employees get an Online Personal Account with access 24/7. These accounts bring safe, reusable storage of personal and dependent medical information year after year. Should you move to another broker who uses FormFire, your plan needs changed, or your employees go to another employer, all accounts are transferable and portable. Best of all, by using FormFire, you the Employer get easier plan shopping—your organization can check true pricing on each available medical benefits option with minimal effort.